When you think of a role model, who do you think of? For many youth in the MENA region, they struggle to picture positive role models that reflect their own backgrounds and culture—leaving some of them isolated, alienated, and vulnerable to criminal and extremist recruitment. That’s one of the reasons why, two years ago, Hamza Chraibi founded Arab Excellence. 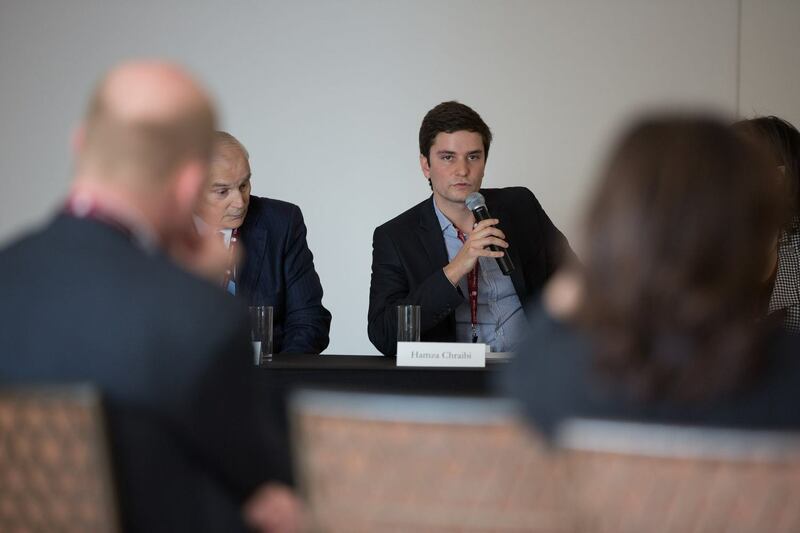 Here, Mr. Chraibi, founder and current president of Arab Excellence, describes the inspiration, development, and future trajectory of the organization’s skills-based empowerment programming for youth in the Arab world and beyond. I grew up in Morocco, and I was very confident about my country, my culture, about the Arab culture in general. When I went to Europe to complete my studies, though, I realized that many people in other countries had other conceptions about the region. Due to what’s happening in the region, many confuse Arab with Islam, and Islam with terrorism, and it really bothered me on a personal level. Meanwhile, when I was back home, my mom—who was a teacher at a school for underprivileged kids—used to tell me that the kids don’t want to come to school anymore, they don’t believe in the system. And it’s not something only in Morocco, it’s something quite global. This younger generation has lost hope and doesn’t believe in this system anymore. They think that if they are born in an underprivileged area, they won’t be able to achieve any kind of excellence. In order to achieve excellence and become successful, they assume, you need to be privileged and go abroad. In the first year, I ended up meeting amazing achievers from the region who started from scratch—entrepreneurs, thinkers, CEOs, artists. Some were very famous, some were not. Quickly I realized two things: the role models really valued such an initiative, and they believed that this could create a movement in the region for the youth. The second thing is that when I started testing this approach and doing some events and workshops for the underprivileged youth, I realized that these messages of positive role models and hope had an impact on the students. But I didn’t know how to make it concrete. I was joined by a team of great leaders and experts from different backgrounds to build this common vision. We spent many months thinking and interviewing various people and groups to figure out how to bring Arab Excellence from an inspirational project into real empowerment. How could we leverage these powers of positive role models and actually have a concrete impact on the life of the youth, in terms of education and employment? We looked at many new programs in California, South Korea, India, and Norway, among others, but there was no existing model based on role models in another country. With TED for example, you go to TED talk, you listen, and you get inspired, but it’s only inspiration. On the other hand, many groups deliver concrete empowerment through skills-based training, but they lack this inspirational and role-modeling element that gives a real push. Meanwhile, while talking to and assessing specific schools, universities, and educational institutions, we found that these institutions had a need for programming that bridged this gap between inspiration and empowerment—so we decided to create it. First, it was leadership-focused, leveraging in an explicit way the stories of positive role models that have made it before, to help students first get some confidence and believe in themselves. The second step was to deliver specific tools to help students go from their dream to an action plan—to make it happen with specific tools like diagnostics, mind maps, road maps, and so on. Based on this formula, we did a bootcamp for the students of INSEAD as well for students in public schools in Morocco. The results were mind-blowing. We saw the students going from “I don’t know what I’m going to do with my life” to “This is exactly what I’m going do, this is how I’m going achieve it, this is my vision, this is my plan.” Using role models can have a huge impact on the new generation. Now we’re working with other universities, high schools, and educators to build programs for them. The programs include skill sessions—emotional skills, communication skills, networking skills—as well as mentorship. We’ve been replicating these programs for different groups, especially for the underprivileged schools that need it very much. Arab Excellence participants at a program held at the Casablanca Stock Exchange. Now Arab Excellence is becoming a real movement that includes international private companies, universities, schools, foundations, and role models as well as governments. It is going to take time, but I believe that we need to involve a whole ecosystem to be able to impact in a large scale. In that sense, we focus more on the story and the journey rather than the end point. It’s not just about being born in a rich family, taking over your family’s business, and becoming the CEO of a big company. Our goal is to stop students from finding excuses as to why they cannot achieve excellence—“I cannot achieve excellence because I am born in Lebanon, I’m from Morocco, or because I’m from this neighborhood.” But when we show them that there are people who grew up in a desert, a slum, who managed to make it, then young people open up their eyes and they start believing in themselves. We started this program for the Arab region, whether the students are Arab or not. But we have gotten interest from people who wanted to launch such programs in Pakistan, India, or even Africa, so we’re planning to help them extend it into something that is not only in the MENA region. We started first with the youth, and at the same time we try to focus specifically on women and girls. We believe that women and girls have the potential and talent to achieve excellence in all fields, but sometimes it is more challenging and there are fewer chances to find opportunities to optimize their potential than men. So we try to focus on this group, leveraging women role models and women champions to push young women to build their personal vision and create their own opportunities. We focus on those who are motivated and want to start building their own dream. We do not hand anything to our participants, but we help them build their future. Finding role models was a challenge at the beginning, because using role models and one’s story to empower others is such a new concept in the region. Most of the time we at Arab Excellence focus on the end result. But in this region, we don’t want to talk about our achievements or story—because it means you’re showing off. We have to change this mindset because, at the end of the day, some members of the young generations end up getting inspired by the wrong role models such as criminals or terrorist guys who lead them to Syria and Iraq to fight for ISIS. That’s why it’s about time to change this mindset, and not be afraid to focus more on concepts of excellence, role models, and success. Even if Arab Excellence was not created as a result of the rise of new terrorist groups, it is definitely affected by these events in the region, in the sense that recent events have raised awareness of the need for more of these programs, more of these positive role models. Now, the world sees that if you don’t have more positive role models to these kids, they’re going to shift toward other groups. Some youngsters now see ISIS as role models in the region. ISIS is doing a great job in terms of inspiring the kids to join them—so it’s our duty to do these programs. If there’s not a movement to fight for the new generation on the positive side, then we’ll have more people from this part of the world joining these groups. Lack of hope, lack of perspective, and lack of a future are big incentives for joining these groups. But when we show them the example of Mohed Altrad who grew up in the Syrian desert, as an orphan Bedouin, and become one of the most successful entrepreneurs of the world, then it shows the youth that they have no excuse—and it’s effective. To track the impact of our programming, we have collected the data of all the students, and we follow-up with them every three months for two years to see how they’ve evolved. For example, more than eight students in the UAE that went through the program became young role models themselves, launching their own ventures, and will probably join the Arab Excellence mentorship program to empower the younger participants. 41 others there are currently working on their ideas to try to make a concrete venture. 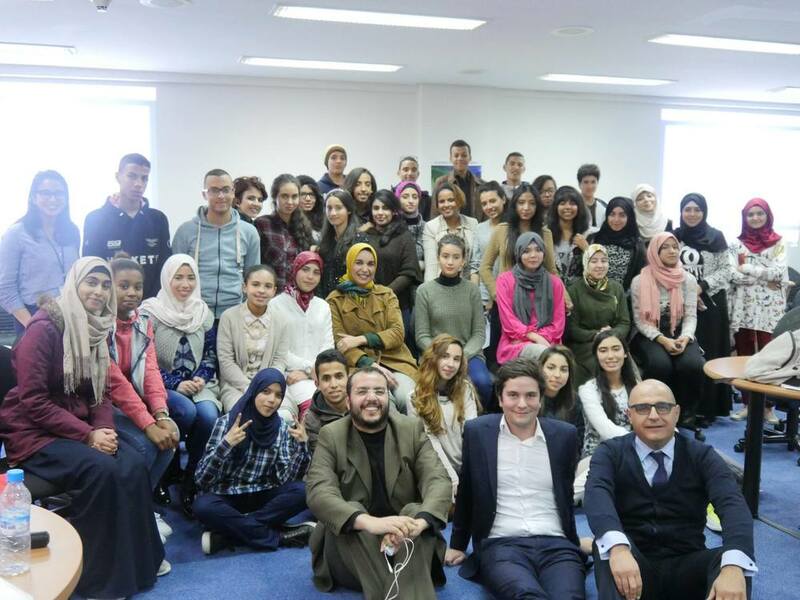 Finally, 35 public-school students who have followed the program in Morocco now have a clear and articulated vision for their future, have recently obtained better grades in the last national exam, and have increased their commitment and motivation while getting themselves surrounded by positive mentors from their community. For now, we’re focusing on a few countries, like Morocco and the UAE, where we are really active. We also have programs going on in Tunisia and Lebanon. First, we want to make sure the program is well-run and perfect before we begin customizing it to different communities and regions. Eventually, though, we’re not going to be only Arab Excellence—we’re going to create different brands for different groups, such as women or refugees. The idea would be to train the trainers. I’m sure there are a lot of young role models who can interview other role models and inspire the new generations and customize programs for them. So the idea is to make it globalized and international, but at the same time, have local impact with local teams; to have a narrow brand, but also tailored each locality. That’s something needed not only in the region, but across the world. Banner photo shows Mr. Chraibi speaking at Dean International Council in Doha, Qatar. Photos provided by Arab Excellence. To learn more about Arab Excellence, visit their website and Facebook. No Replies to "FOSTERING EXCELLENCE IN THE ARAB WORLD—AND BEYOND"